Custom Air Products & Services, Inc. (CAPS) is proud to announce the upcoming roll-out of their new mobile technician dispatch program, MobileTech. CAPS is a leading commercial and industrial heating, ventilation, and air conditioning (HVAC) company headquartered in Houston, Texas. Providing our technicians with the information they need to get the job done correctly and efficient while satisfying our customers' needs is essential. Custom Air Products & Services, Inc. (CAPS), a leading commercial and industrial heating, ventilation and air conditioning (HVAC) company based in Houston, Texas (US) is proud to announce the upcoming roll-out of their new mobile technician dispatch program, Key2Act’s MobileTech. 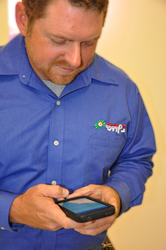 The MobileTech product provides technicians with the ability to electronically complete service tickets, fill out required forms (refrigerant tracking, for example), distribute a summary of work performed via email, obtain approval signatures from customers, and more. The product also provides field technicians with service histories, in the field, in order for them to provide more informed diagnoses and expedite repairs when possible. Implementation of the new software began at the beginning of the year for CAPS with intensive training for management, supervision, and office personnel. Roll-out efforts remain on schedule as it is currently being presented to, and implemented by, a few technicians at a time. Roll-out completion and full implementation is scheduled to begin on Monday, April 4, 2016. Any questions about this product or its implementation at CAPS may be directed to David Loya or Corrie Haines at 713-460-9009.